It’s true, there are fewer Condos and Houses selling in 2018 when compared to the last 3 years, down 25% and 55% respectively since 2015, consistent with the broader Metro Vancouver area. On a month to month basis, November saw 2.5% fewer condo sales in North Vancouver than in September, a much better performance than the Greater Vancouver condo market, which saw a 17% slump in October. These end-of-year dips are expected and are in line with historical seasonal real estate activity. North Vancouver Home Prices, however, have remained strong, with Detached Houses & Condos seeing a 2.5% and 33% increase in average Sale Price respectively, since 2016. 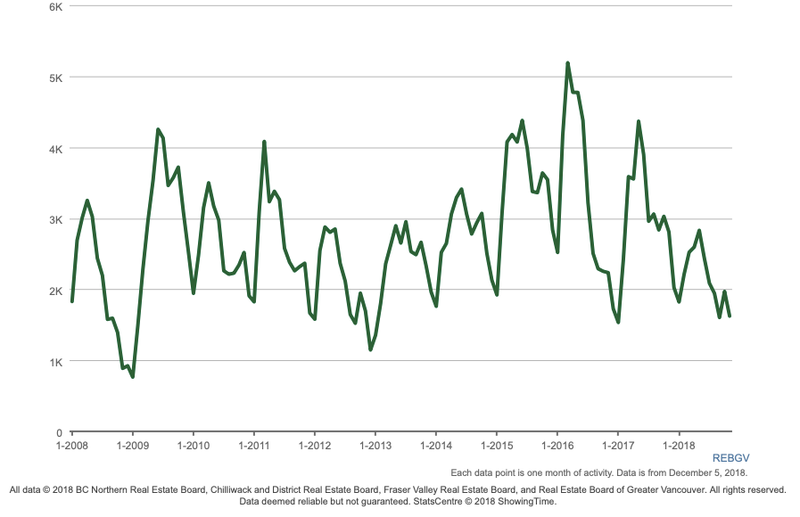 Real Estate activity is dipping as we move towards the end of the year, and we’re expecting a surge of activity in early 2019 in line with historical data from the Real Estate Board of Greater Vancouver. At a benchmark price of $574,000, the market for North Vancouver condos appears to have weakened slightly in 2018, and we can see a downward trend the last three months. In perspective, Richmond condos have a benchmark price of $658,500. With the North Shore's proximity & easy access to Downtown Vancouver and ever-expanding restaurant & lifestyle scene, North Vancouver is expected to remain a strong market moving forward. North Vancouver house prices have been trending downward since the high seen in March, coming down approximately 14%. However, this data must be put in context: the average Sale Price of detached homes has increased by more than 22% since January of 2015; not a bad return on investment! With nearly 11 months of inventory for sale, the North Vancouver detached house market is in buyer’s market territory. In Buyers Market’s, purchasers typically have greater power to negotiate prices down and ask for concessions. The condo market in North Vancouver has become balanced with only enough condos available for sale to last less than 4 months at the current level of buyer interest. Those looking to purchase townhomes will also be looking at a balanced market with just over 5 months of inventory on the market. The market for North Vancouver townhomes has been favouring sellers the past few years and only recently entered a buyer’s market. In the real estate industry, there are metrics used to indicate when buyers and sellers have more negotiating power. As a rule-of-thumb, less than 5 months of inventory (i.e., homes for sale) means it is a “Seller’s Market” and the seller has the upper hand in a price negotiation. When there’s more than 9 months of inventory for sale, it’s a “Buyer’s Market” and buyers have more negotiating power. With this information in hand, Sellers – and buyers – can be more laser-focused with their pricing strategy and be better prepared to attain their objectives. There is - as ever - uncertainty in real estate these days. The markets for both houses and condos in Metro Vancouver are trending toward a position where buyers can ask more from sellers, and this holds true for North Vancouver. Deciding when to buy or sell real estate is often based upon more than sale price, but it is ever a factor. If you are going to try to time the market, consult your real estate professional as data & trends for specific neighbourhoods may differ the larger region. This market update is brought to you by Alex Mackenzie. He is a Realtor specialized in North Vancouver real estate.